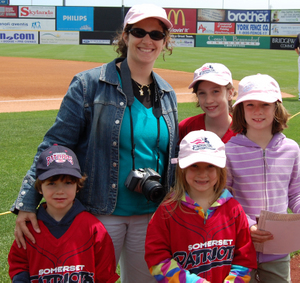 Bridgewater, NJ- The Somerset Patriots and the Somerset Health Care Foundation will host a special Mother’s Day Celebration featuring Breast Cancer Awareness Day and honor Women In Baseball at TD Bank Ballpark on Sunday, May 12th. All moms and their children will be invited down on the field to begin the event with a special mothers and kids catch beginning at 11:00 am. The catch is a first time event for Mother’s Day, modeled after the team’s very popular promotion held each year on Father’s Day. The Patriots will host a special Mother’s Day Brunch from 12:00 pm to 2:00 pm in the picnic patio. Brunch tickets are $39 a person, with a portion of the proceeds benefiting The Steeplechase Cancer Center at RWJ University Hospital Somerset. Brunch ticket holders will enjoy a special menu and can watch the game from the picnic patio overlooking left field. To purchase tickets for the Mother’s Day Brunch online, select Mother’s Day Brunch or Ballpark BBQ options. There will be a pre-game ceremony recognizing breast cancer survivors, volunteers, and representatives involved in the fight against the disease. The pre-game ceremony is scheduled for 12:30 pm and will include representatives from the Steeplechase Cancer Center, breast cancer survivors, and special guests. The game against the Lancaster Barnstormers will begin at 1:05 pm. All Patriots players and coaches will be wearing pink Patriots jerseys in the style of the classic baseball movie A League Of Their Own. 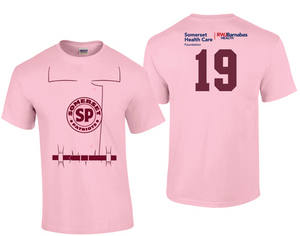 The jerseys are designed to honor women in baseball and will be auctioned off during the game to benefit The Steeplechase Cancer Center. Fans can bid on the game-worn jerseys through the team’s DASH Auction platform both online and through the Patriots Mobile App during the game. The first 1,000 women in attendance will receive a Pink Patriots Jersey T-Shirt in the style of the jerseys the players will be wearing for the game. The Steeplechase Cancer Center, RWJ University Hospital Somerset and the Somerset Health Care Foundation will be onsite to educate, distribute information and fundraise through the jersey auction and other onsite activities. 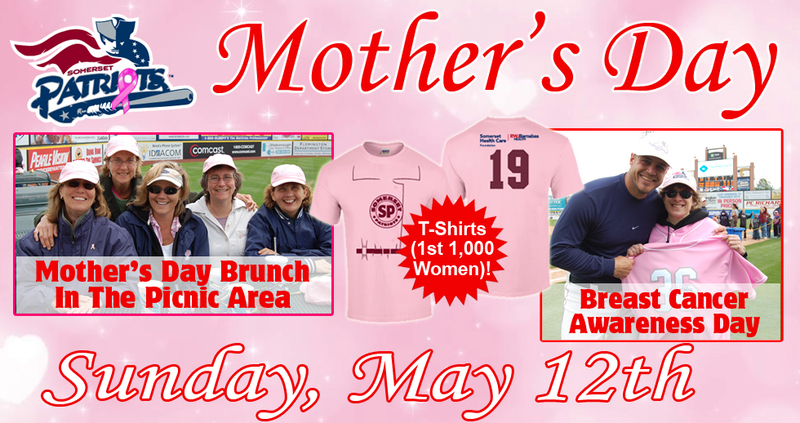 For tickets for the Somerset Patriots Mother’s Day event featuring Breast Cancer Awareness Day and a tribute to Women In Baseball, stop by the ticket office located at TD Bank Ballpark, call (908) 252-0700, or visit www.somersetpatriots.com. The Steeplechase Cancer Center, located on the campus of RWJ University Hospital Somerset in Somerville, provides comprehensive cancer treatment within a calm, compassionate, patient-focused cancer care center. Somerset Health Care Foundation provides funding to RWJ University Hospital Somerset - the only hospital in Somerset County - enabling it to provide comprehensive health care in a patient-friendly environment. Donations to Somerset Health Care Foundation help to enhance their facilities, technology and patient care so that they can continue to improve and save lives within the community. For more information, or to make a donation, please visit www.rwjbh.org/rwj-university-hospital-somerset/giving.